Why your School Needs a Mobile App ! If you’re are a parent with school age children, you know how busy your life can be. It’s challenging to keep track of your daily job and personal responsibilities, let alone everything that’s going on in your children’s lives; homework, tests, sports and school events. More and more, parents expect to interact with schools as they do other aspects of their lives from paying bills to grocery shopping and scheduling events. Being connected to your school through your mobile device means that you never miss out on important reminders. Receive notifications from your parent group and school administrators about upcoming events, such as the fall carnival, fun run or the book fair as well as when school photos are scheduled or if there is a minimum school day. Did you ever forget to call in your child’s absence or add money to your child’s lunch account? With just a touch of a button, you can report your child’s absence and pay their lunch account all from the palm of your hand! Parents are playing more of an active role and volunteering to help at their child’s school. With direct access to volunteer links, parents can easily sign up for an event without having to log into their email. This saves time and helps parent groups and schools run successful events. 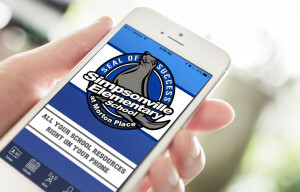 Mobile devices are such a huge part of our lives, and apps are so easy and accessible to use that having a customized school app is a smart and easy way to stay connected, informed and organized.